INTERESTING FACT: Whiskey cocktail recipes generally recommend a lowball glass. Go to our Cocktail Glass Guide for more on cocktail glasses. “Whisky” (without the “e”) comes from Scotland or Canada. Almost all other “whiskeys” come from elsewhere. We use the two interchangeable, but each recipe gives an indication which whiskey is preferred. Where it does not, any whiskey can be used. Then again, any whiskey can be used at any time – as always we recommend you experiment with flavours. Whisky is rich in flavour and taste. The classic Cocktail Manhattan uses whisky as its base ingredient. With so many whiskeys available, on the market, one cannot be expected to carry nearly a representative collection in your home or commercial bar. Cocktail Mixing Master recommends a fairly priced blended whisky, like Bell’s or J&B, for cocktail mixing. Also, keep a bottle of boubon whiskey like Jack Daniel's. A classic pre-dinner drink. Sometimes referred to as a “Manhattan Dry”. Preparation:Stir the ingredients and strain into the glass. Variant: serve on ice in a low ball glass. Split the part dry vermouth into 0.5 parts dry and sweet vermouth each to create a “Manhattan Perfect”. This is a variant of the “Slow Comfortable Screw” (see our Vodka Cocktail Recipe Guide ), where the vodka and gin is not added. Preparation:Shake the ingredients with and strain into the glass. Garnish: Banana slice. This brings out the fruity aroma of the Southern Comfort. Southern Comfort is an orange and peach flavoured whiskey from the USA. Also a very versatile mixed drinks ingredient. Great old classic. The sugar goes well with the whisky. Preparation:Stir the bourbon and bitters with a few ice cubes and the sugar. Add just enough soda water to dissolve the sugar. Add more ice if required. Garnish: Orange slice and/or lemon twist and cocktail cherry. 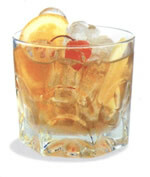 Vary the bourbon with Scotch whiskey to make a “Scotch Old Fashioned”. There is a belief that you will be cured by “the hair of the dog that bit you”. It’s often used in relation to hangovers i.e. take more alcohol to sooth a hangover. This drink is indeed a good cure for hangovers as far as the “hair of the dog” is good for you. See our Hangover Cures Guide for more. Garnish: Orange slice and cocktail cherry. This is an international drink invented in Canada. It’s original French name is “Trois Rivieres”. Garnish: Orange slice or serve ungarnished. Professional bartenders will lead you to believe that you cannot make this cocktail with something else than real Scotch whiskey. But, then, you know better than that. Preparation:Stir the ingredients in the glass. A perfect drink for St. Andrew’s Day (30 November). We recommend you make this one strong. Preparation:Pour the whiskey over ice in the glass and top up with tonic water. Replace the whisky with vodka to create a “God Mother”. A sour sharp whisky cocktail. Preparation:Shake the ingredients and stain into the glass. Check in frequently as we update the and expand the cocktail recipes often.